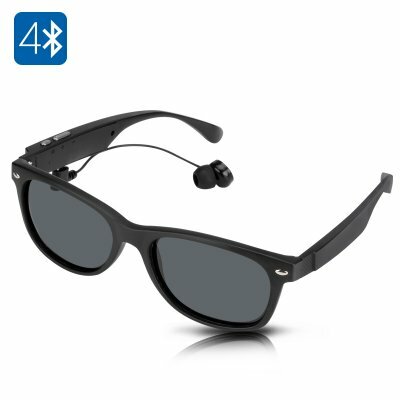 Successfully Added Wireless Bluetooth Sunglasses - Call Answer, Play Music, Hands Free, 15 Meter Range, 4 Hours Play Time to your Shopping Cart. These sleek, lightweight sunglasses will do much more than protect your eyes this summer. With Bluetooth connectivity you can listen to music, answer calls directly through the shades. A real head turner these sun glasses offer Bringing you absolute freedom the Bluetooth sunglasses connect to your phone or tablet wirelessly so there are no cables or dangling cords getting in the way. With impeccable style the sunglasses are the perfect accompaniment to a day oin the beach or when driving. With one touch you can answer calls, or listen to music even if your phones at the other side of the room or buried deep in your bag. This wireless headset will deliver hands free communications and brings protection from UV rays so you can look cool and protect your eyes this summer. These Bluetooth Sunglasses are brought to you by the leader in electronic devices as well as wholesale hands free kits, headset and cool gadgets.. Thank you for your product and fast delivery. Looking forward to more deliveries from Chinavasion.